Launched in 2017 as one of the first of Crystal River's "Rhine Class" vessels, Crystal Mahler defines luxury river cruising in a way that's radically different, and in many ways more successful, than you find on its competitors. The differences aren't just in the decor and hardware you find on the 106-passenger vessel, it's in the programming and onboard atmosphere that Crystal Mahler provides. Crystal Mahler eschews many of the onboard trappings that you find on other river cruises. There's no folklore entertainment shows, no daily port talks, no announcements, no broadcast commentary during scenic cruising. Passengers dine when and where they want, sitting at tables for two and four. Even though the ship carries fewer people than other river vessels its size, you might not see them again for a few days. It feels much less like a group tour than any river cruise we've been on and much more like a stay at a luxury hotel that happens to float. The dining on the ship is fantastic, and truly Michelin-inspired, in inventiveness, ingredients and presentation. All breads and pastries are baked fresh daily. Because diners come in at their own pace, the entrees are made to order. Traditional dishes such as Dutch fish and chips are elevated with playful touches. Casual dining at the Bistro is also delicious, with a to-die-for burger at lunch and a diverse global tapas dinner menu. Room service is available, 24/7. True gourmets can pay an additional 290 euro for an eight-course wine pairing meal in the Vintage Room that rivals a Michelin meal on land (which it should, at that price). If you're a foodie, this cruise is for you. Service, too, rivals what you'd find in a luxury hotel. It's intuitive, yet still professional and formal, as befits the feel of the ship. Most of the staff is European, and they will work to learn your drinking and dining preferences. On sunny days, they are busy at the pop-up bar on the ship's sun deck, keeping everyone hydrated and pampered. Because the ship does not do port talks to explain the excursions or next day's activities, destination staff have "office hours" where people can have their questions answered. If you're a wine lover, the sommelier will pop around to make sure you're enjoying what you're drinking. Crystal Mahler implemented a new approach to shore excursions in 2018. Offerings are now divided into several categories, with several choices in each port (including the ability to design your own with a concierge). 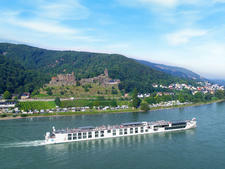 Our experience with the tours on the Rhine has been mixed. In Amsterdam, we took a fabulous bike ride through the lowlands that culminated with us riding on one of the country's famous dikes. In Cologne, however, a city walking tour was less successful, as evidenced by the number of passengers we saw peeling off to do their own thing (we saw several of them in the town's Louis Vuitton store). Reactions to the guides in Wurzburg also seemed mixed. 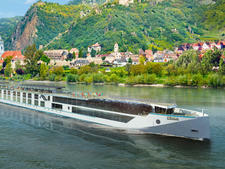 Crystal River Cruises is still relatively new in Europe, and it might take the line some time to build up the stable of guides that other river cruise companies, many of whom are part of large land tour companies, have. Doing their own thing seems to suit the Crystal Mahler passenger; anything that smacks of herding is anathema to most onboard. A Crystal river passenger has their own agenda of what to see and do -- and the lack of organized talks and activities fits them just fine. It does make the onboard experience feel a little antisocial. Crystal Mahler is a ship designed for couples: most of the tables in the dining room are set for two, as are the comfy swivel chairs in the Palm Court Lounge and many of the cushy shaded sofas on the sun deck. Small groups onboard tend to keep to themselves. We've seen solo passengers busy with a book at breakfast, comfortably alone and not looking to interact. 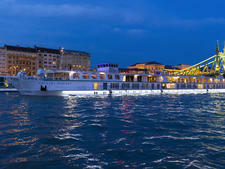 It's all very restful, far much more so than your typical activity-heavy river cruise. And, in the end, that's how Crystal Mahler defines luxury: plush surroundings, best-in-class food and service, and the ability to tailor your time to your own pace and interest. It's a different approach than you see elsewhere, even with other luxury river cruise lines such as Tauck, Uniworld and Scenic. If you've considered luxury river cruising, but the thought of groups and forced socialization gives you the willies, Crystal Mahler is definitely the ship for you. Passengers on Crystal Mahler are well-traveled and affluent. The line says that about 51 percent of the people on its river cruises have sailed with Crystal Cruises on its oceangoing ships or yacht. The demographic is on average also slightly younger than Crystal Ocean, although still primarily in the 60s, 70s and 80s. On our Rhine sailing, passengers ranged from a millennial tech couple living in Seattle to a multigenerational family to retired couples (the majority). Most of the passengers are American, but other countries such as Mexico, Colombia and Italy were also represented. Children may sail, though Crystal reserves the right to restrict the number of children aged 3 and younger. Children under 6 months aren't permitted. During the day, casual and comfortable clothing is fine for Crystal Mahler. Days are usually spent in port so comfortable walking or biking shoes, as well as layers for Europe's changeable weather are appropriate. Crystal Mahler has a pool, so swimsuits and cover-ups are worn there, but not in dining spaces at any time. Neither are baseball caps. In the evening, passengers wear "Crystal Casual," which means slacks or skirts with blouses or sweaters, or casual dresses for women. Men wear dress pants with open-collar, collared or button-down shirts. No ties or sports coats are required, though casual jackets are fairly common on men. Crystal Mahler includes all meals and drinks, including wine, Champagne and spirits, soft drinks, teas and specialty coffees. (It also includes these items in the mini-bars, which are replenished as necessary.) Wi-Fi, 24-hour room service, movies and music on-demand, and gratuities for all ship staff are included. There's a complimentary self-service laundry for passengers wishing to wash, dry or iron their clothing while onboard. Pressing is complimentary and you can give it to your butler, whose services are also included in your fare. Cruise fares also include transfers to and from the airport, as well as at least one shore excursion in each port. Once per cruise, Crystal also holds a complimentary Signature event. Laundry service, upgraded shore excursions, premium wines and spirits, and spa treatments cost extra. The euro is the onboard currency.